When it comes to growing food, especially organic, having quality soil is crucial. In fact, after years of abusive agriculture systems providing our food, this fact is even more clear. Though still much healthier than the more sought-after processed foods, fruits and vegetables have actually decreased in nutritional value since the 70s. The reason why is in — or actually not in — the soil. The evils of industrial monoculture systems have no doubt become more and more apparent in the public sphere, and once again, it’s these systems that are largely responsible for why our food is no longer as nutritious as it used to be. Not only do they poison the environment with pesticides and other chemicals, but they have also destroyed the soil. And, that’s a big problem. Permaculture guru Geoff Lawton explains the situation very well by comparing current eating habits to modern farming habits. In his line of thinking, if we look at human health now, based on artificial additives and chemical cocktails, versus when organic was just the status quo rather than a marketing scheme, the current system has caused serious damage, namely higher rates of diabetes, cancers, heart disease, allergies, obesity, and more. The further we moved away from nature, the more unnatural overweight and ill we became. Plants are the same. They used to be selected for nutrition and taste, and of course, having healthy, rich soil was crucial to producing good ones. But, yield, appearance, and shelf life surpassed these criteria, and our plants became reliant on GMOs and chemicals, the soil on artificial fertilizers. Our food, in turn, has become unnaturally large, just as we became overweight, and now lacks the minerals and microelements of nutrition that once came from healthy soils. In essence, we’ve fed our fruit and veg on processed food, and the results pretty well match what we’ve seen from feeding humans processed food: oversized and undernourished. A healthy soil is, no surprise, full of life. When we spray with pesticides, however, we kill both the insects we are targeting and lots of beneficial insects, worms, and other animals. When we spray fungicides, we kill troublesome diseases our plants might have, but we are also killing beneficial fungal networks in the soil. When we don’t add bacteria elements, like organic compost (or manures) to the soil, but instead inject herbicides, the beneficial bacteria isn’t there to keep things functioning. In short, a healthy soil has all of these things: insects, including pests; fungi, including those that destroy crops; and bacteria, symbiotically interacting with plants’ root systems. Healthy soils, unlike those we see in the clean rows of monoculture crops, are covered in organic material, which is constantly being cycled back into the soil to regenerate the nutrients that were there. The decomposition of organic material feeds the soil so that it can feed the plants so that they can feed us. The biomass atop the soil also provides a protective habitat for the soil life, prevents erosion of topsoil from wind and rain, and stops the soil from drying out due to evaporation. Thus, healthy soils are rich in organic materials, full of life, moist and loose (mulch also prevents soil compaction). Healthy soil is not bare and constantly tilled as seen in industrial agriculture. This would deplete the soil of nutrition, which in turn would deplete the crops, which in turn would deplete us. While there are plenty of organic sources of food out there out our disposal now, they might still be lacking. Many farms bearing the organic label still run rather sanitize, industrial systems with soil additives and pesticides derived from natural sources. Unfortunately, this can have a similar result, something akin to drinking orange juice instead of eating an orange or having white bread versus whole grain. There are a lot of trace minerals, fiber, and so on missing from the mix. It’s probably a bit much too ask that we all become self-sufficient homesteaders; however, we can definitely grow a good bit, if not all of our fruit and vegetables, on a typical 1/4-acre suburban lot. 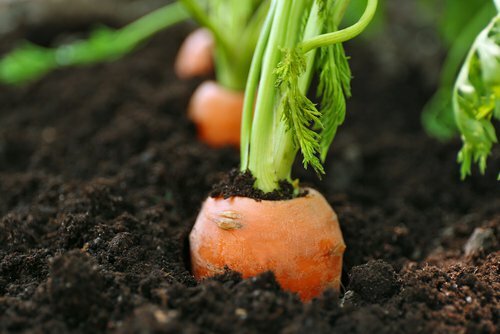 Then, we have the ability to foster our own healthy soil and make sure our carrots are as nutrient dense as ever. That’s why homegrown is the best!